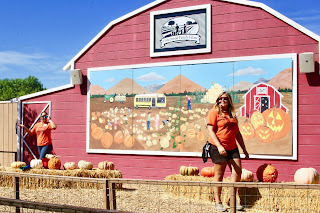 Underwood Farms hosts their Fall Harvest Festival to much acclaim each October. The farm is swarming on weekends with families as a long queue of minivans slowly make their way into the overflowing parking lots. This is where things might get a bit confusing. 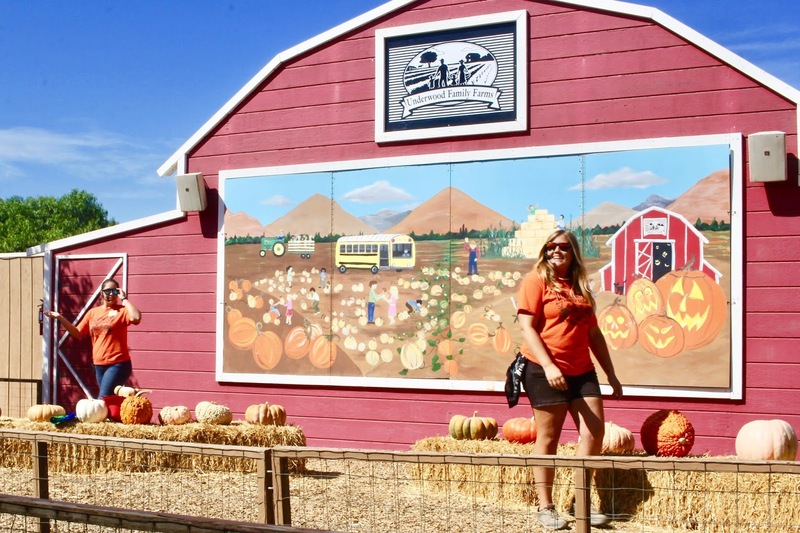 The best bet is to follow the big orange pumpkin signs pointing the way to the main entrance which is around the corner from the typical entrance next to the fruit and veggie stand. 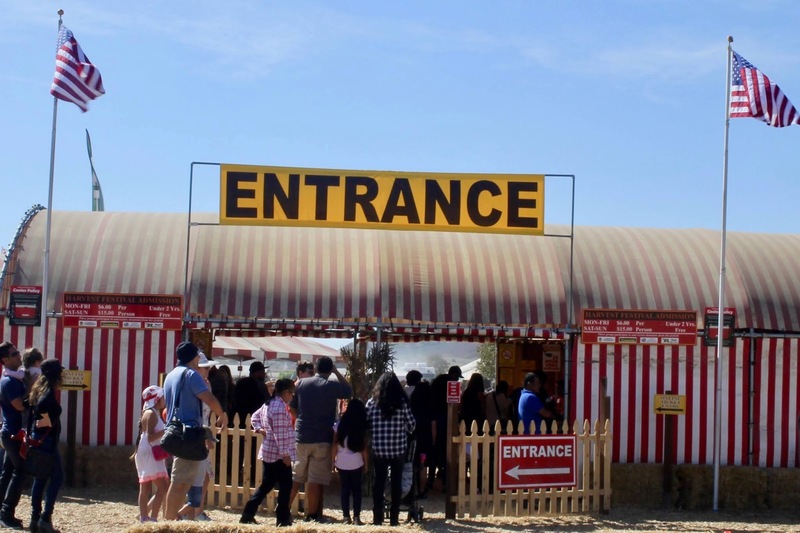 Even if you are handicap accessible, I would recommend going around to the temporary main entrance as there are a handful of handicap parking spaces. The only problem with this entrance is the exit where the floor is covered with something resembling wood chips (?) that made it impossible for me to move my walker over said chips. Thankfully I was strong enough to push and pull my walker through the exit into the parking lot. But I need to warn my accessible friends. 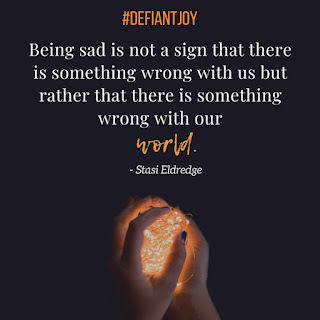 If you will be having troubles there still are handicap parking spots in the front where it might be easier to get in and out. 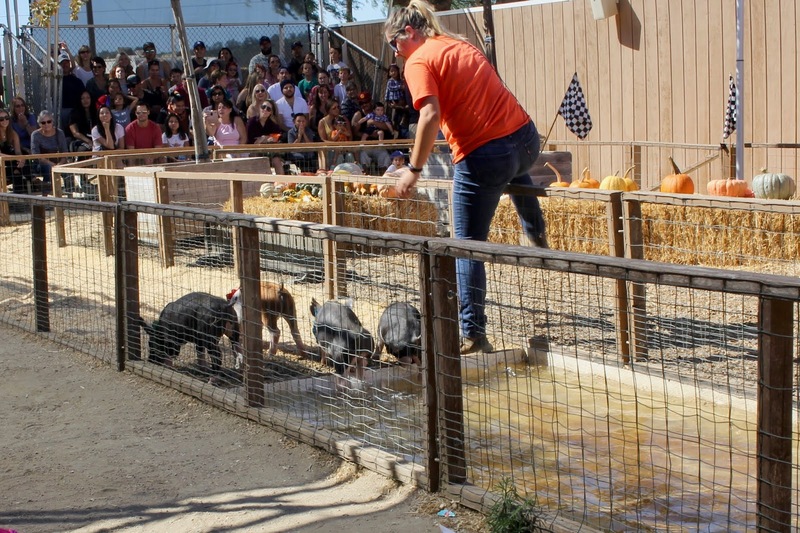 On the weekends, there are a dozen or so extra events that do not happen on the average weekday including my favorite (pig races) and animal shows and musical performances. You can pick up a calendar of event times at the front when you check-in and also online. 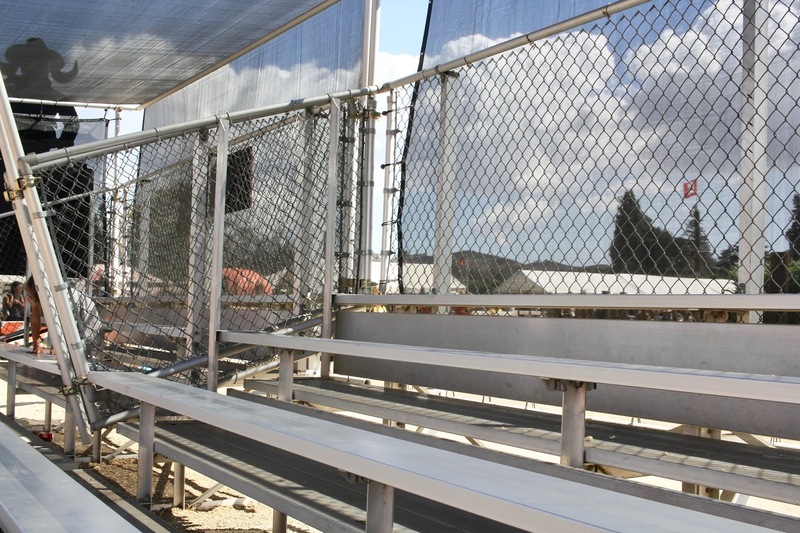 At the animal show and pig races, it is bleacher seating. There are reserved accessible seats at the animal shows (Thank you, Underwood!) 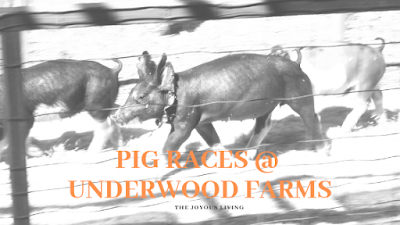 however nothing is reserved for the accessible at the pig races and seats go so fast that you will likely want to arrive about 30 minutes prior to the show time to snag a seat. 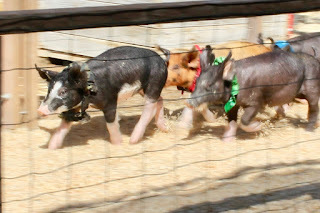 Anyone who knows me knows how much I love the baby piggies each spring at Underwood Farms. And so I was super excited to hear they were having pig races (something I never witnessed before). 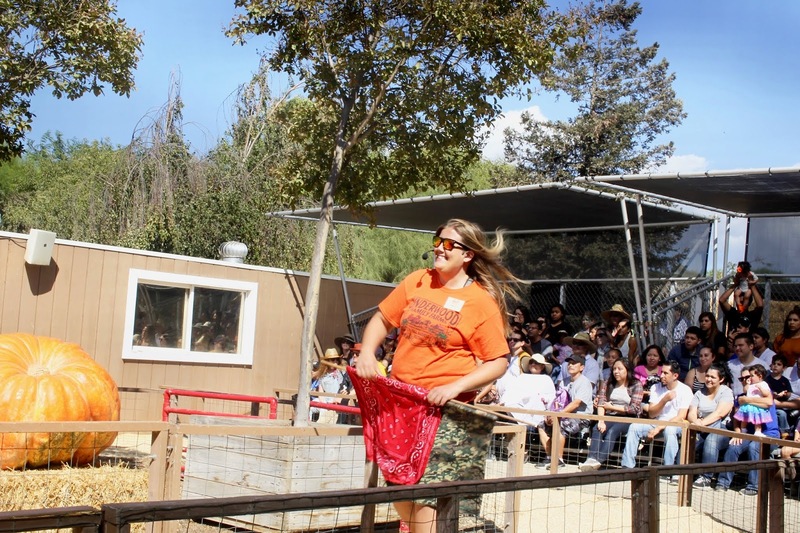 The two emcees were fabulous young ladies with great energy and have been trained and follow a strict protocol for the safety and well-being of the animals and visitors. "The pigs live in well-kept pens and we work with them and train them for 2 months prior to our Festival so they are comfortable with the route. As most animals are motivated by food, pigs are the same and it is important that they are rewarded for completing the task that they were trained. At the end of the run, they are not only given treats, but praise and pats by our team members. 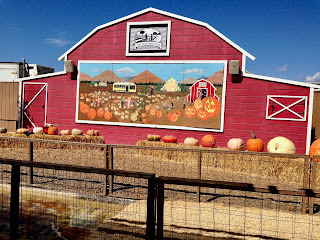 They lead a very good life on our farm." 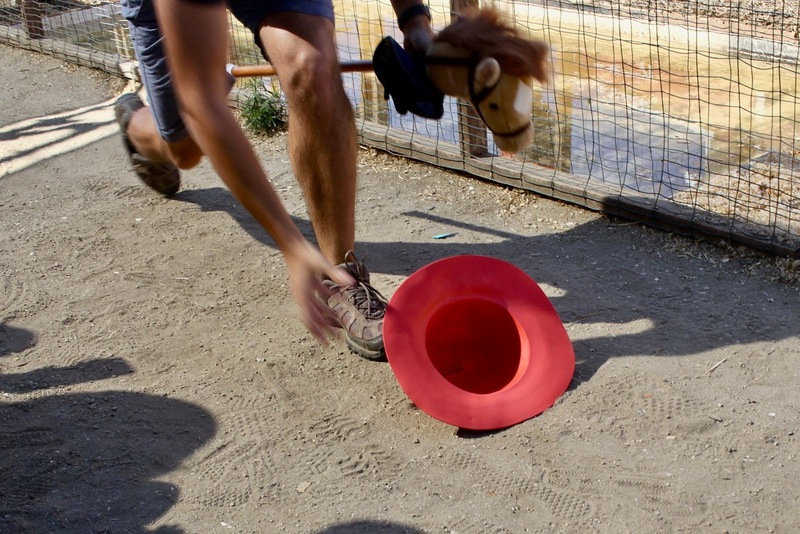 The farm's animals are under the watchful care of the farm's Veterinarian who is on call 24 hours, 7 days a week. The animal program meets the standards and follows the management practices of the USDA who hold random inspections throughout the year. 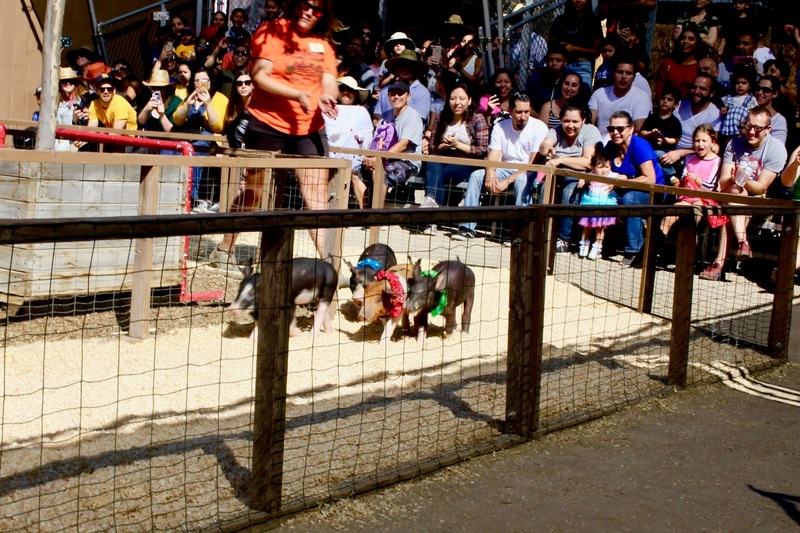 The piggies went around the track for three separate loops and the emcees had to encourage the cuties along because they were much more interested in eating whatever yummies were on the track. My area of the track was assigned to cheer for the cameo green piggy and he actually was the fastest on two of the three races but funny enough all four piggies stopped at the entrance into the barn before the red one pushed through. 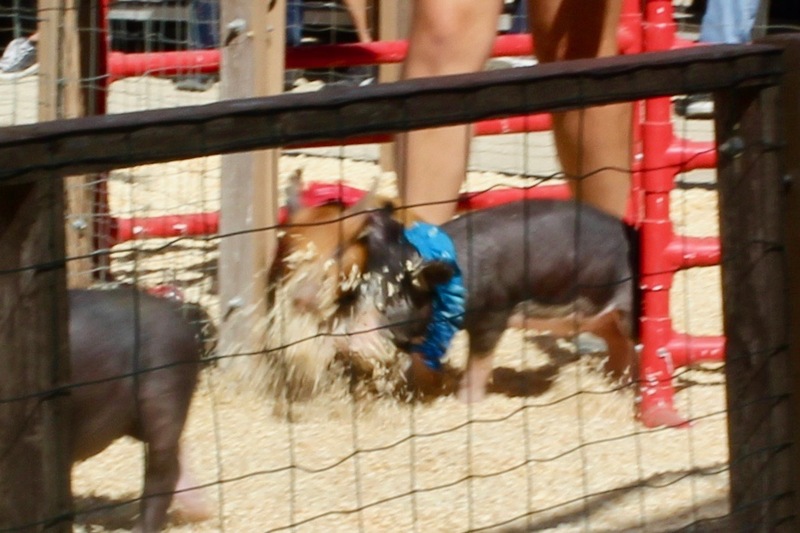 No matter whether your piggy won or not, you were destined to have a great time. Between each round, the emcees did a good job of engaging the audience in lighthearted competitions. The last competition was between two good spirited dads who had the audience laughing out loud. 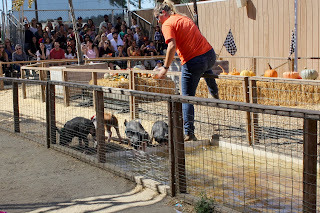 The water crossing was definitely the cutest as you watch the piggies hesitate before jumping across. 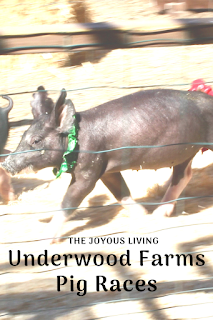 If you've had the pleasure of seeing the springtime piggies you will enjoy seeing the older piggies as they trot along the course. 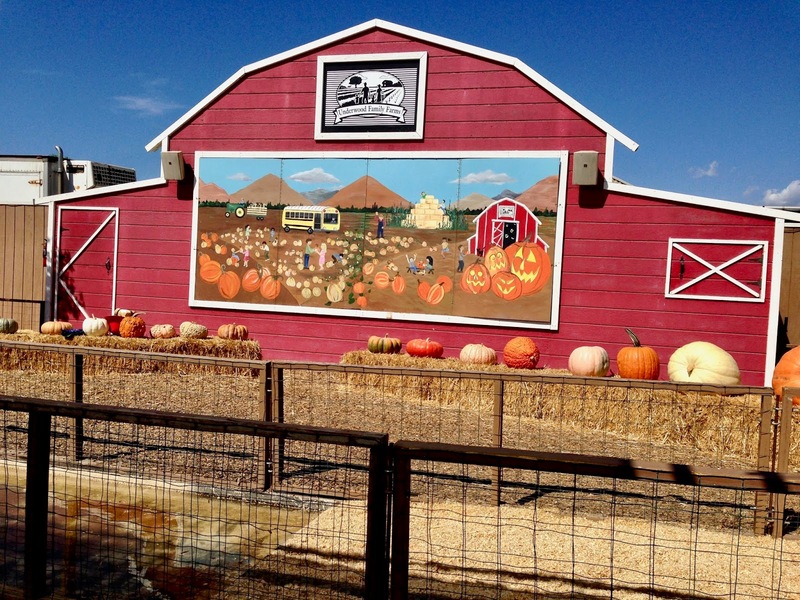 All the other animals are also on display as per norm including goats, emus, rabbits, birds, etc. Weekend Festival admission includes tractor-drawn wagon ride, corn maze, corn stalk labyrinth, Pig Races, Animal Show, Pumpkin House, Pumpkin playhouse, live music and entertainment, access to Pick-Your-Own fields and Pumpkin Patch, Animal Center including Bee Barn, hay pyramids, Fun Hill, Kid's Corral, Farmer Craig's Chicken Show, Combine Slide, Cotton Harvester Slide and more! For information on activities included with weekday admission as well as ticketed attractions and prices, please visit our admission &amp; tickets page. 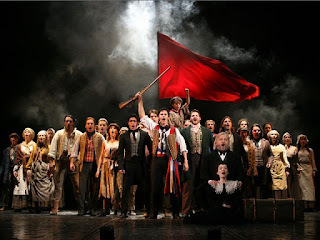 Tickets can also be purchased at gate. See gate admission above. Weekday tickets are purchased at gate only.